The Pickled Herring: Christmas is around the corner! It's about this time of year when I start getting Christmas on the brain. Yes, I'm definitely one of those people who watch Christmas movies unacceptably early and start listening to Amy Grant come October (ok ok, I've already listened to her Christmas album once...). I just love Christmas time. Since we had Astrid, it's been really fun talking about what kinds of traditions we want to have as our own family of 3. We always are traveling to our respective families homes for the actual day, but for the past few years we celebrate just us on New Years Day. I love waking up at home and drinking coffee by our tree. It's the BEST! And now it's even more exciting that Astrid is in the mix. I think she will be really into everything Christmas this year, including the cookies! In the spirit of Christmas soon approaching, I decided to do some prelimary "research" on what cookies to make this year. 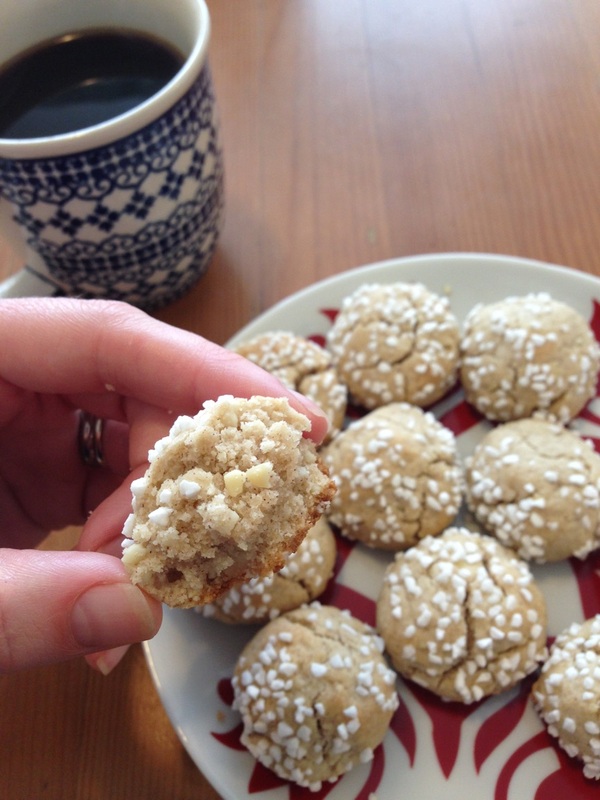 So I bookmarked some new Swedish cookies I haven't made before and decided to bake and eat my way through them to see which ones would make the cut for this year's Christmas. It's tough work, but someone has to do it. First, I baked these Almond Spice cookies from the famous Swedish cookbook Swedish Cakes and Cookies (or Sju Sjorter kakor in Swedish). I love a good spice cookie in wintertime and these didn't disappoint. Be warned though, they are subtly spicy, not like gingerbread or pepperkakor. They only contain cinnamon and cardamom for the spices - one of my favorite spice combos! 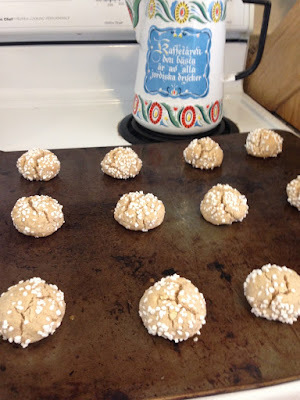 I really enjoyed the texture of both the ground almonds in the cookies, and the pearl sugar on top. And don't worry, I didn't eat the entire place of cookies. Verdict: I liked them! Especially warm from the oven. After I bake through more recipes, I'll do a final verdict of what makes the Christmas Cookie list for 2016 - these are definitely a contender! Preheat oven to 400. Beat butter and sugar until light and fluffy, add egg. Combine remaining ingredients and add, kneading lightly. Form into small balls and roll in pearl sugar and place on a greased baking sheet. Bake for 10-12 minutes. 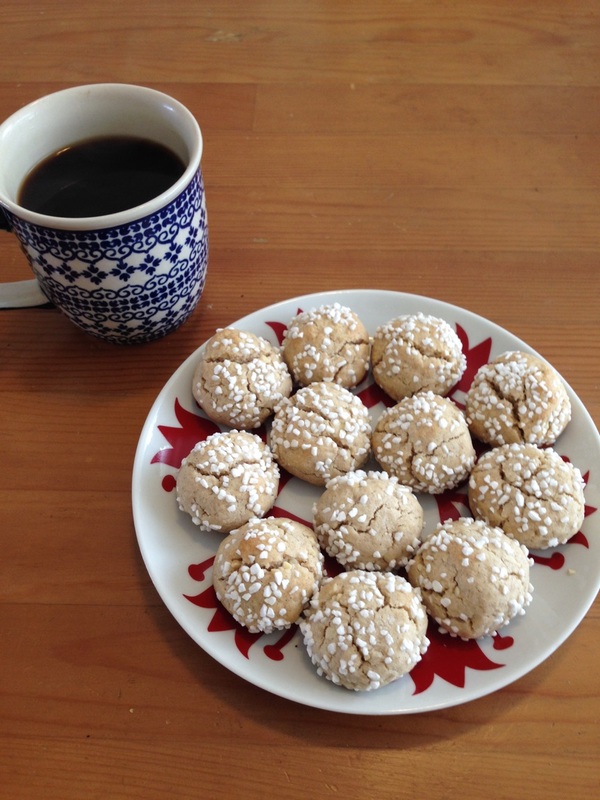 Notes: I found 10 minutes was perfect - the bottom of these cookies seemed to brown quickly. I would check them early. They didn't stick to the pearl sugar easily when I rolled the balls in; I had to gently push the sugar into the dough. If you don't have pearl sugar, I'm sure regular sugar would suffice but you'd miss out on the crunchy texture that it offers. If you have a local IKEA you can check their pantry section - they used to carry it in the past at ours, but I haven't seen in there in about a year now.